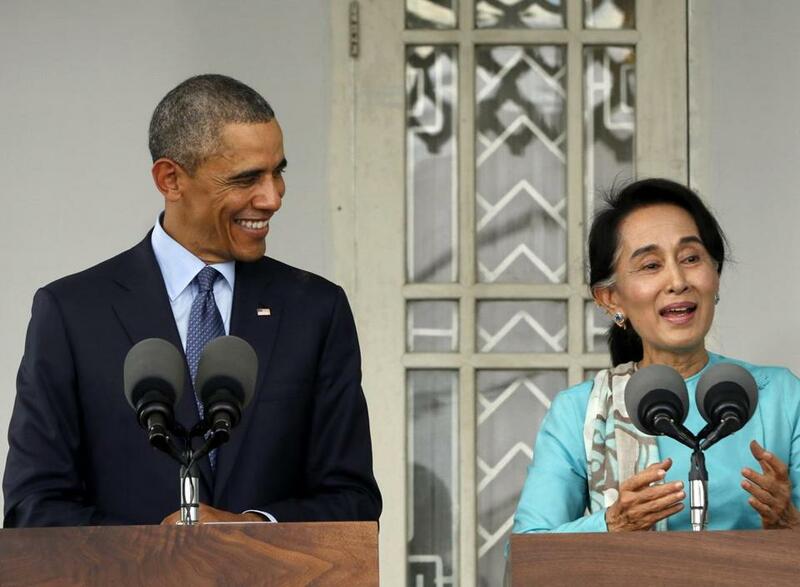 President Obama and Myanmar opposition leader Aung San Suu Kyi held a joint press conference at her residence in Yangon last week. This week’s international headlines look awfully daunting to Americans. Tuesday’s vicious Palestinian terrorist attack in Jerusalem reminds us anew of the raw presence of hatred and violence that rules the streets of the modern Middle East. The Ebola outbreak continues to plague three poor countries in West Africa. Russia continues its merciless assault on eastern Ukraine. No wonder then that President Obama is looking toward Asia as the region where he has long wanted to pivot and where there are positive, even historic, opportunities for US foreign policy. In fact, Obama’s trip last week to China, Myanmar, and Australia was one of the most successful of his presidency. The key stop was Beijing, where Obama and Chinese President Xi Jinping announced a bilateral climate change agreement in which they committed to major reductions in carbon emissions and effectively challenged the rest of the world to reach a global agreement in 2015. Obama and Xi also agreed on badly needed transparency measures between Chinese and American armed forces in Asia and on important trade and visa arrangements. What is most encouraging about the climate deal is that the United States and China are learning to meet global challenges together. And it validates Obama’s determination, starting at the 2013 Sunnylands Summit in California, to build a strong working relationship with Xi, China’s most powerful and self-confident leader since Deng Xiaoping. Obama can also take indirect credit for last week’s first-ever meeting between Asia’s dueling rivals — Xi and Japanese Prime Minister Shinzo Abe. Their desultory photo op told a thousand words — these two nationalist leaders don’t like each other very much but have pulled back from their showdown over the Senkaku islands in the East China Sea. By making clear last spring that the United States would honor its defense obligations to Japan in the event of a conflict there, Obama sent an important signal to China to defuse the crisis. If Obama can now secure a region-wide free trade agreement, the Trans-Pacific Partnership, in 2015 he will have strengthened America’s strategic position in Asia substantially. Republican leaders in Congress will support fast track authority to complete the negotiations, thus pressuring notoriously reluctant Democrats to support it as well. Whether Obama can continue his run of foreign policy successes depends on outmaneuvering two difficult adversaries in the weeks ahead. At the G-20 Summit in Australia, Obama warned combative Russian president Vladimir Putin about his continued supply of tanks and armored personnel carriers to pro-Moscow separatists in Eastern Ukraine — a blatant violation of the UN Charter. But Putin will see that as a hollow warning unless Obama pushes harder to convince reluctant Europeans to expand economic sanctions against Moscow. Obama should also reconsider his refusal to send arms to an embattled Ukrainian government. The only way to deal with bullies like Putin is to confront them with countervailing strength and pressure. The other challenge is next week’s deadline for international negotiations to stop Iran’s nuclear weapons ambitions. Obama has skillfully deployed coercive diplomacy against Iran’s Supreme Leader, Ali Khamenei. Tough US and EU sanctions helped force Tehran’s agreement a year ago to freeze its nuclear program in place. If a final agreement is not possible by the November 24 deadline, many in Congress will press Obama to suspend talks and agree to a new round of sanctions. The smarter play is for Obama to lock in a continued freeze and keep talking to Tehran. If Congress gets its way, Iran will almost certainly resume production of highly enriched uranium, thus losing what has been gained in the talks so far. Diplomacy is still the best path with Iran’s difficult government. The road ahead is not easy. But Obama has more than two years left in office and is armed with strong constitutional authorities to conduct foreign policy, despite losing the Senate to Republican control. His critics would be mistaken to count him out just yet.